UW pre-optometry students to the rescue! Stella, nailing "The Treat Game" with her assistant, named Baby. Stella knows how to use “WHAT! ?” for comedic effect. At PCC, the natural grocery store we hit up to three times a day, there are fun sculptures outside. In reference to one of them she exclaimed, “A dog on a bike–WHAAAT! ?” Just a sliver of a pause inserted. She went ahead and tacked on the prolonged “WHAT! ?” in a flat yet exaggerated way, the timing and tone appropriate for SNL or In Living Color. Clearly, she’s a comedic genius bound for stand-up stardom. As I’ve hinted at before, here and at Little Four Eyes, accomplishing our allotted daily vision therapy is a challenge. A grind. More for me than for Stella. In the way that getting up at 5 AM is challenging for a wine-guzzling nightowl. (I swear that’s not me. Usually.) I’m not the most organizationally proficient mom you’ve ever met–unlike my cousin who organized, within an inch of its life, the kitchen drawer that holds her young daughter’s dishes and utensils. To me it was an awe-inspiring thing of unattainable beauty. Honestly, I’m just happy to have identified a drawer into which I can toss that stuff from across the room, since it’s usually left open. When it comes to what needs doing in daily life, I get it done, but piles, toe-stubbing, sweating, and flat-out sprinting are involved. My creativity helps compensate, though. It kind of makes up for the disarray. I write fabulous copy for a range of clients in order to pay for Stella’s vision therapy and other stuff, and enjoy it, and I easily conjure up ways of executing or adapting vision therapy so that it’s somewhat innovative and actually fun for my two-year-old, who is quite young to be doing vision therapy in the first place. I find this type of work–the creative part of vision therapy, but not necessarily the execution–incredibly motivating and satisfying. Which is only natural, but somehow my difficulty seems much more severe than it should be. Of course, it’s not some horrible Sisyphean nightmare either. I believe in vision therapy. Though I struggle with getting it done, our daily work is incredibly valuable and effective, and Stella is resilient, adaptive and more cooperative than she gets credit for. Oh, and she’s creative, too! Using random objects like bulb syringes and blocks and ribbon, she’ll construct a tall, thin structure with a rounded top and say, “Look, mommy! I made the Space Needle!” And you know what, it really, really looks like the Space Needle. Clearly, she’s a brilliant engineer/designer bound for international renown. Genius aside, when it comes to vision therapy, it really, really helps that she’s willing to step up to the very hardest challenges for a taste of Theo chocolate, made one neighborhood over from where we live, just down the block from Cody’s workplace and PCC. We often stop in for tastings, pretending to be tourists, though I’m not sure we’ve ever fooled anyone, even with our well-honed Boston accents, since we are loud, include a toddler wearing purple glasses, and head directly to the Hazelnut Crunch every time. In the context of “The Treat Game,” explained in my recent post at Little Four Eyes, she’s now grabbing two cards at at time so as to find matches twice as fast. Those red/green glasses just aren’t posing enough of a challenge anymore. Not when Theo chocolate is on the line. That’s my girl. But I know we can’t rely on chocolate. That’s simply the trick I keep up my sleeve. We have been in need of assistance for a while now. As opposed to my mental lopsidedness, my sister is organized AND a creative problem solver. When I told her I was thinking of hiring someone to come here a couple times a week and help with our at-home vision therapy, she immediately suggested that I find an optometry student. I was all, “Brilliant!” Because wouldn’t you know it? We live right next to a giant university–WHAAT?! So I got in touch with an officer in the pre-optometry club at the University of Washington and she kindly put out the word. I’ve received five applications from wonderful young minds! I’ll not only tell them everything I know about vision therapy and provide true insider information on to get Stella’s cooperation, but I’ll also throw in a pot of coffee and some sort of hourly rate. The peace of mind I’ll get, and the likely improvement in Stella’s outcome, will be worth it’s weight in Theo chocolate. Wait. Maybe I should pay my vision therapy assistant in chocolate bars? What can’t that stuff do? And that’s not all! I’ve got a lead on a fantastic babysitter and zeroed in on a preschool that may just be ideal for Stella, due to its notably bigger focus on physical activity and fitness than any other preschool I’ve learned about. They have gymnasts and professional ballet dancers work with the little ones an hour a day–WHAAAT?! Feels like we’re on the brink of being on a roll. We might even, after almost two and a half years, get some much-needed support–WHAAAT?! Honestly, it’s not just Stella’s eyes that need the help. It’s me. 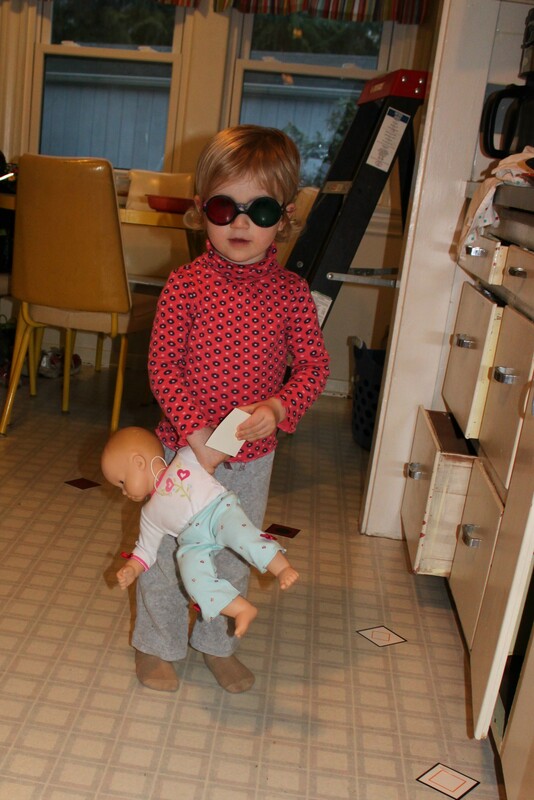 This entry was posted in Family update, motherhood, toddler, vision therapy and tagged accommodative esotropia, amblyopia, glasses, motherhood, toddler, UW pre-optometry, vision therapy. Bookmark the permalink. 1 Response to UW pre-optometry students to the rescue! Awesome Amber, so glad you are lining up some help it will be so good for both of you!